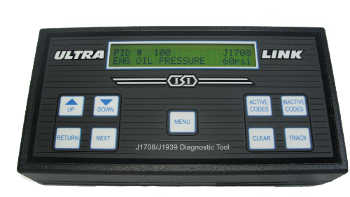 The XL1000 ULTRA-LINK Diagnostic Tool is a universal tool designed to work on ALL diesel engines, transmissions and ABS brake systems utilizing J1587/1708 and J1939 protocols. 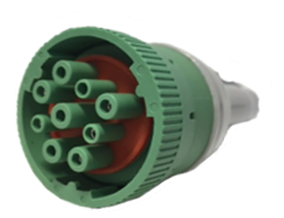 For vehicles with the new green 9-pin Deutsch diagnostic plug. UPGRADE AVAILABLE for existing tools. Yours to use as you please. No time bombs, cartridges, or mandatory software updates. Does not require a computer to use. Simply plug into the diagnostic port for instant data. Quickly view a wide variety of performance parameters in real time. Stores up to 36 records in the Ultra-Link XL 1000 before requiring to download. Playback a previously stored record. Look at any record stored as though you were still hooked up to the truck. View all parameters and trouble codes without having to be connected to the PC. Available for 12 or 24 volt systems. Quickly pinpoints problems and eliminates guesswork. Track mode allows selection of up to 4 parameters to be displayed on the same screen for comparison. 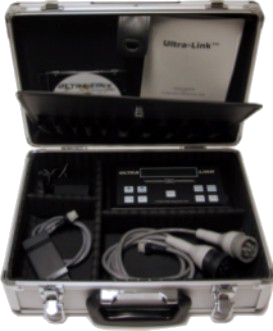 The ULTRA-LINK Diagnostic Tool, Instruction manual, 2 harnesses (6 & 9 pin Deutsch),USB Transfer Cable and a rugged carrying case. Strong polycarbonate case utilizing rugged long use tactile keys. Easily switches to display US or Metric values. ** For safety reasons, it is not recommended for one person to operate the ULTRA-LINK XL Diagnostic Tool and drive the vehicle, at the same time. When test driving, use a designated driver.